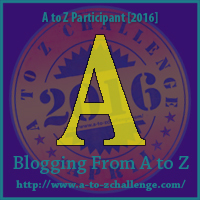 During the month of April, I'll be participating in the A-Z Blogfest. My theme is how to make money writing. A= Articles- A couple of years ago, I was between day jobs and in need of cash. I started writing articles for different people and organizations. Repeat clients were a sports magazine--I knew nothing about sports, but the mag was impressed enough with my publication credits they gave me a shot--and a real estate agent. To get started, I created a new blog and did a couple of posts on real estate to have an applicable writing sample. If you're seriously trying to snag an article, creating a similar writing sample makes it much more likely than using something in a different genre because it's already written. A=Advertisements- Today, I got a random email from someone asking to advertise on my blog. I sent them my price sheet. I haven't heard back yet, but if I do that is extra money. This has happened in the past. I've done sponsored posts for different companies. You can actively seek ads on social media or use Google Ad Sense. (Google Ad Sense can be fickle though. For whatever reason, they won't allow my blog ad sense). A=Anthology- Anthologies are sometimes quick cash and sometimes not so much. Some anthologies will pay you a flat fee for your story. Whatever you make, it's up front and done. Royalties are nice but can take forever to come in. The other plus of an anthology is that it gets you in front of other authors' readers, which can boost sales and build platform. I think whether you're working for royalties or a flat rate there are perks of anthology. Great ideas. Thanks and they work for any genre of writing as well, good job. I hope you enjoy the blog challenge. Never actually thought about advertisements for other people before. Interesting. Great advice. I am working on an anthology story now. I used to do adverts for a site called Pay Per Post, but stopped after a while because I figured it's not really what I wanted to do on my blog in the long term. I'd say Anthologies are not so much for the money, but more to gain new readers.